In the early 2000s, Israel suffered a series of horrific terrorist attacks from suicide bombers. Typically, a Palestinian youth from the West Bank or Gaza Strip carrying a hidden bomb, would sneak into an Israeli café, shopping mall or restaurant and detonate it. In 2002 alone, there were 47 attacks with as many as 23 people in one single bombing. The Israeli government seemed powerless to stop these attacks. They tried bombing the headquarters of the Palestinian Authority. The Israeli army also made several sweeping incursions into numerous Palestinian cities. The operations were constantly met with hostility that resulted in many deaths on the Palestinian side. Since Israel was dealing with an enemy that has no regard for human life, a campaign of total destruction would be the only way for Israel to win the conflict. In late 2002, Israel decided the best way to deal with the violence was to physically seal itself off from the Palestinians. It began constructing a massive barrier system that would reach 300 miles in length. The barrier was an amazing success. Between 2000 and July 2003, 73 Palestinian suicide bombings targeted the Jewish state, killing 293 Israelis and injuring over 1,900. However, from August 2003 to the end of 2006, only 12 attacks were carried out, killing 64 Israelis and wounding 445. By 2008, there was less than one attack per year. Another major step toward isolation came on September 12, 2005, when the Israeli cabinet decided to withdraw its settlements and military forces from the Gaza Strip. Once Israel left, a new problem was created as Hamas used the ballot box to gain political control of Gaza. In 2007, Hamas showed its true colors by murdering all of its political opposition in Gaza. Israel’s decision to separate itself from the West Bank and Gaza Strip produced a rare moment of tranquility for the Jewish state. The removal of the threat of terrorism caused the Israeli economy to boom. The Palestinians floundered as they lost access to jobs in Israel. They were like a parasite that had lost contact with its host. To combat Israel’s solution to the terror attacks, a comparison began to be made regarding Israel’s treatment of the Palestinians and South Africa’s treatment of non-whites during its apartheid era. Because the comparison was so ridiculous, the people making the claim were sheepish at first. But still, the liberal media used every opportunity to nourish the analogy. Over time, the people who like to get their news hand-fed to them became convinced that Israel is somehow oppressing the Palestinian people. Any Palestinians with common sense would know that they were far better off under Israeli rule. In Gaza, the leadership style of Hamas can only be compared to the Nazis. When a group of Palestinians dared to complain in public about the government’s mismanagement of food programs, Hamas’ policemen came and executed over 30 of them. Having adopted two separate standards for Israel and the Palestinians, the press allows itself to ignore Arab atrocities while blaming Israel for infractions it has no control over. Demonic delusion has become so pervasive in these last days; the world community has lost the ability to realize how unfit the Palestinians are at managing their own affairs. The West Bank and Gaza Strip are just giant welfare states that are being founded by our tax money. There was zero outrage when it was revealed that Hamas had built hundreds of tunnels, costing $1 million dollars each, which sole purpose was for launching attacks against Israel. It should have at least generated laughter when it was recalled that Hamas had told Israel that all the millions of tons of cement they were importing was being used to build schools, homes and hospitals. For decades, anyone wishing to express their anti-Semitic views has had to contend with the monumental shame and revulsion generated by the Holocaust. In over a dozen European nations, it is against the law to publicly claim there was no systematic genocidal killing of Jews by Nazi Germany. The taboo of being anti-Semitic is being chipped away at on several fronts. One argument is from people who claim their beef is only with the nation of Israel. They’re anti-Zionism and not anti-Jew. The act of spray painting swastikas on Jewish synagogues and graves is just another form of political protest. What is helping anti-Semitism the most is the rapid rise in the Muslim population in Europe and other western nations. In France, over 15% of the population is Muslim. Since most followers of Muhammad might as well have hatred of the Jews written on their DNA, French Jews that have lived in France since Roman times are increasingly finding themselves under attack. Most of the blame for anti-Semitism in Europe is the lack of action on the part of the government. Muslims are able to hold signs that read, “Death to Jews” and “Hitler was right!” because the police are too cowardly to deal with them. In one German city, the police allowed the Muslim protestors to use their loudspeakers to broadcast anti-Semitic slogans. Europe’s toying with anti-Semitism is like a drunk saying, “One little drink won’t hurt anything.” The world has fallen off the wagon so many times, we should be watchful of anything that looks like a relapse. All the plaques and memorials that stretch from Spain to Russia with writings that exhort, “Never Again” don’t do any good if we don’t uphold this simple promise. One way for some Jews to deal with the growing anti-Semitism is to blame their own people for the problem. They may attempt to find peace of mind by rejecting their connection to the God of the Bible and the right for the existence of the State of Israel. One of history’s great examples of a self-hating Jew would be Dr. Max Naumann of the Association of German National Jews, which had 7,000 Jewish members. His organization advocated adherence to the Nazi party despite its open hatred of Jews. It was joked that his followers would end their meeting by giving the Nazi salute and shouting “Down With Us!”. Naumann said in one interview that Nazi actions against Jews were largely justified. His loyalty did not endear him to Adolf Hitler. In 1935, Naumann’s organization was declared illegal, and he was arrested the same day and imprisoned at the Columbia concentration camp (Columbia-Haus) situated in the Tempelhof area of Berlin. The doctor was spared the ironic shame of dying in a gas chamber by expiring of cancer in May of 1939. One of the most influential self-hating Jews of today is Jon Stewart of the Daily Show. His needling of Israel for defending itself while ignoring the brutality of Hamas is proof that he wears the stripes of a Jew that loathes his own race. Stewart is also a faithful lapdog for Barack Obama; the most anti-Israel president since the Jewish state was founded. Jews have nothing to gain from a policy of appeasement. Their enemies will only be satisfied by their total destruction. By acceptting guilt that doesn’t belong to them, Jews are supplying the rope to hang themselves. “And among those nations you shall find no rest, and there shall be no resting place for the sole of your foot; but there the Lord will give you a trembling heart, failing of eyes, and despair of soul”(Deuteronomy 28:65). The prophetic language of Matthew 24 has convinced me that even Jews living in America are not safe. When Jesus said “ye shall be hated of all nations for my name’s sake” (Matthew 24:9), this has to be double reference to the Jewish people. Christians have been widely hated, but never by the whole world. What has made the Jews a target is the conflict between God and the devil. Because Satan is no match for the Lord of Lords, his strategy has been to go after the Jewish people. By delaying the prophetic promises God made about Israel, the devil hopes he can buy himself more time. Unless he prevents Israel from saying, “Blessed is He who comes in the name of the Lord!” (Matthew 23:38-39), he will soon find himself cast into the pit of darkness for a 1000 years. “And there waswar in heaven: Michael and his angels fought against the dragon; and the dragon fought and his angels, and prevailed not; neither was their place found any more in heaven. And the great dragon was cast out, that old serpent, called the Devil, and Satan, which deceiveth the whole world: he was cast out into the earth, and his angels were cast out with him. And they overcame him by the blood of the Lamb, and by the word of their testimony; and they loved not their lives unto the death. Therefore rejoice, ye heavens, and ye that dwell in them. Woe to the inhabiters of the earth and of the sea! for the devil is come down unto you, having great wrath, because he knoweth that he hath but a short time” (Revelation 12:7-12). To block God’s plan, Satan will use an offer of peace to trick Israel into letting down its guard. 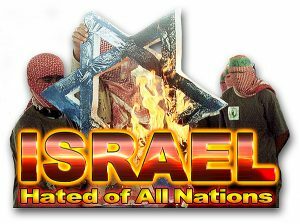 The Antichrist will do what a host of diplomats have failed to achieve for nearly 70 years: Find a solution to the Arab/Israeli conflict. Once the Antichrist gains the trust of the Jews, he will betray them and seek their obliteration. “But if from thence thou shalt seek the Lord thy God, thou shalt find him, if thou seek him with all thy heart and with all thy soul.When thou art in tribulation, and all these things are come upon thee, even in the latter days, if thou turn to the Lord thy God, and shalt be obedient unto his voice” (Deuteronomy 4:29-30).